*Feb 2019 update – after several visits to Kushi-Ya since they opened I upgraded their score from 8 to 8.5. The consistently interesting and well executed specials from leeks to duck harts demonstrate great skill in the kitchen despite only being open a few months. Followers of mine will know that after a successful pop up earlier in the year I have been eagerly waiting for Kushi-Ya become a permanent fixture in the city. An unsuccessful KickStarter campaign fortunately did not stand in their way and in October the former Alley Café site was transformed. It’s still an awkward little unit – as you enter from an alleyway you’re greeted by some dead space before ascending the stairs to the restaurant. Its now a world away from the colourful, busy interior that it was before. What remains is clean simplicity, it could be described as bare but that styling is at home in this Japanese setting. 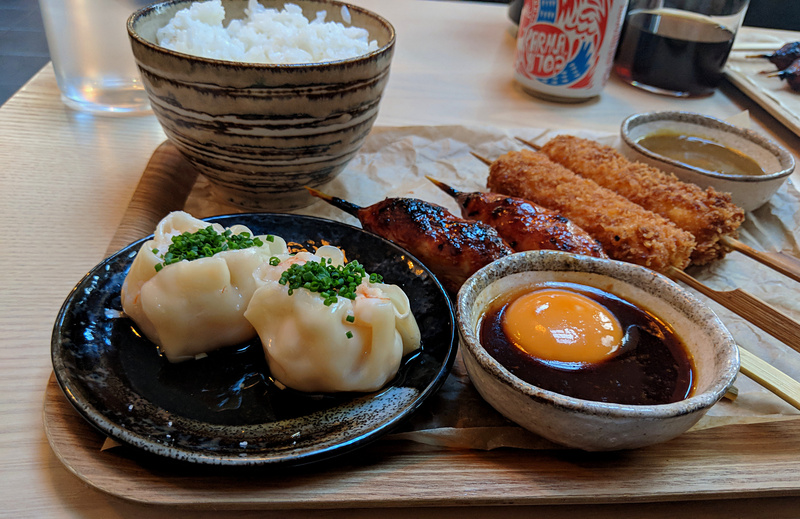 The name Kushi-Ya is a reference to the skewered food that is a prominent feature of the menu, alongside a handful of snacks, 5 small dishes (£5-6.5) and 5 skewers (£3-£4.5). This doesn’t include a regularly evolving specials board that has had up to 6 more dishes depending on availability. I’m fortunate enough to have visited on a few occasions since it opened. Those who have eaten at their pop ups will find familiar food, and familiar quality. The beef skewers with black garlic mustard remain a star attraction, the umami-rich sauce a great accompaniment to the flavourful meat. A personal favourite are the tofu katsu, the crispy coating enough to convince even the biggest tofusceptic, especially at a very reasonable £3. 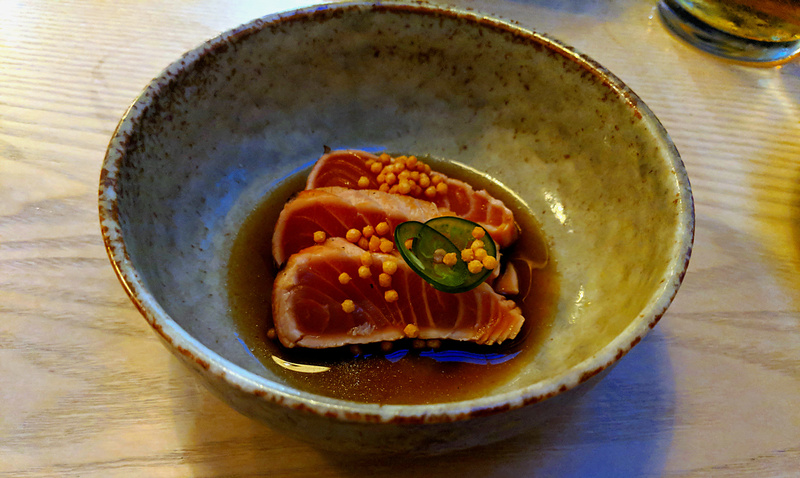 Salmon tataki was not quite as enjoyable as the tuna equivalent I first enjoyed but the jalapeño ponzu was still a winner. Warmth from the chilli and citrus working well with the rich, clean fish. I was also informed that skewers of mackerel with wasabi were excellent, a favourite of my girlfriend’s. I was a touch disappointed with a previously excellent dessert, Tira’miso’. The dish is still well made, lightness of the cream and sponge still particularly impressive. The miso adding a different dimension whilst staying true to what makes a tiramisu great. To my taste the addition (and amount) of nori powder, a seaweed power used widely at Kushi-Ya, detracted from my overall experience. 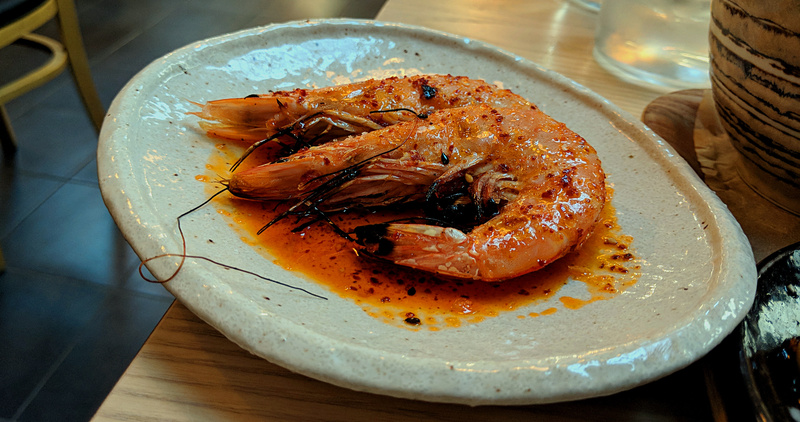 The best thing I have eaten across all meals were probably some prawns simply cooked in their shell with Szechuan chilli oil. I was more than happy to part with my cash for £2 each from the specials menu. In fact the specials were consistently excellent and captured my imagination more, perhaps the excitement of new dishes compared to having had the majority of the main menu previously. I have also tried their lunch offering. You get a snack, 2 skewers and rice for £10. Prawn shumai are probably the best of the snacks, the dumplings generously stuffed with the shellfish. The dressing of chilli and garlic are nice but I would prefer more punch. A new one on me was tsukune. A form of chicken meatball that was wonderfully glazed and served alongside a tare and egg yolk sauce that combine to a enhance the rich, saltiness of the skewers. Their rice is a good example of sticky rice, as standard served with a sprinkling of flavoured flakes and powders that again included nori. It remains a little plain but if you choose a skewer with a sauce of some description then you can combine them to good effect. The £10 deal is certainly a good value way to experience Kushi-Ya. My only criticism would be that you cannot chose one of the specials skewers as part of the deal, despite them being no pricier. My first meals in Kushi-Ya’s permanent surroundings have been enjoyable and promising. I was asked recently what excites me most about a new restaurant. My response was that, having eaten at so many restaurants, I long for something “different”… and Kushi-Ya is certainly that for Nottingham. In some respects I wonder if the menu might be too challenging or inaccessible to some. I know a little about Japanese food but most dishes had an element, ingredient or technique I had never heard of. While I wouldn’t want their elegant menu to become overly wordy, the odd note, or more proactive information from servers would go a long way to combating any fear of the unknown. On that note the service was charming and friendly throughout but its early days and the team’s knowledge is still building. There is already great food here with dishes changing and specials being introduced frequently, (my nori problem aside!) I imagine I’ll become a regular.